Designed to look like real Chinese takeout, these cat toys are strictly for your cat’s pleasure. Handcrafted of durable linen cotton, inside is 100% organic, U.S.-grown catnip. Everything is realistic, from the cute ribbon of squirting sauce to the takeout packaging. We are having a ball watching our kitty go crazy for her "sauces"....so much fun! My 2 cats love these, even the one that isn't usually interested in catnip. They are so cute and well made! Here’s Chinese “food” your cat can really sink its teeth—and claws—into. 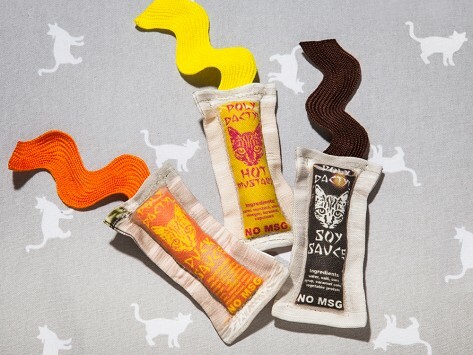 Imaginatively designed to look like real Chinese takeout items, Polydactyl Catnip Cat Toys are hand made with durable eco-felt and cotton canvas that can stand up to a cat’s play and stuffed with 100% organic, U.S.-grown catnip. Maker Randi Warhol wanted unique toys for her unique polydactyl—multi-toed—cat. Not happy with the thin fabric toys sold in stores, Randi put her costume design skills to work. 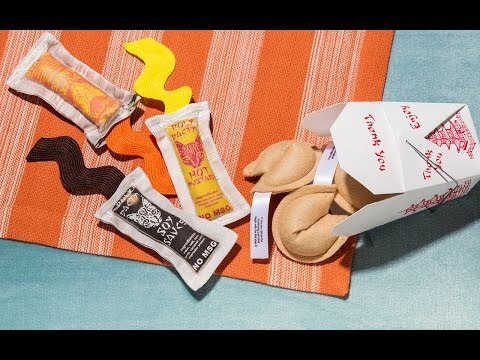 She designed her own line to look like actual sauce packets and fortune cookies, complete with a “squirt” of sauce and cat-specific fortunes. She even packaged the cookies in an actual takeout box. It’s what’s inside, though, that will have your kitty purring. Catnip is a member of the mint family. Natural, safe, and non-addictive, it contains an essential oil that causes a neurological response in cats. Even after the organic catnip in Polydactyl toys loses its potency (after about a week), your cat will have a purr-fectly great time batting and chasing them around.